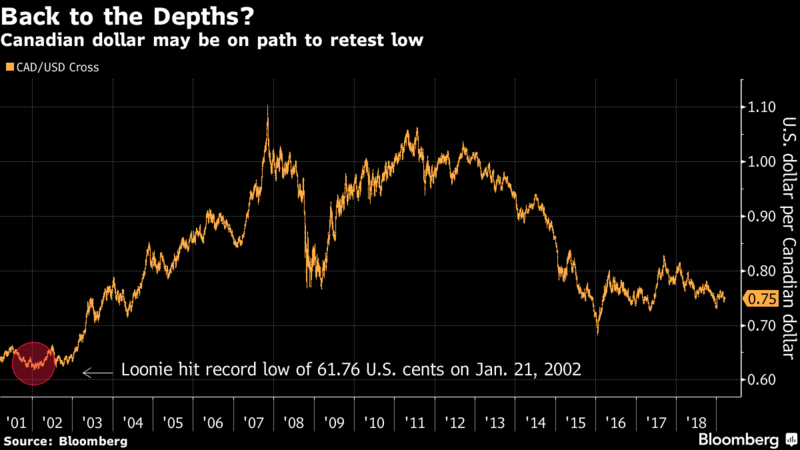 The Canadian dollar may sink back to its record low of 62 U.S. cents ($1.61) as the country retrenches from a consumer-spending boom into the face of a slowing global economy, said David Wolf at Fidelity Investments. The big problem for Canada is that a household deleveraging appears to be starting just as the global economy is slowing, said Wolf, who was was an adviser at the Bank of Canada before joining Fidelity in 2014. Home values fell nationwide last year for the first time since at least 1990, while household debt burdens touched a record high. Meanwhile, Canada’s competitiveness problems remain, he said. Wolf has been bearish on the loonie in the past. Lately, he’s getting some company. Toronto-Dominion Bank downgraded its forecast on Friday, seeing at within a range of $1.35 to $1.40 per dollar (74 U.S. cents to 71 U.S. cents) for much of this year. Citigroup technical strategists are targeting $1.36 to $1.37.